Peaches for me are the ultimate summer fruit. Bright yellow like the sun, juicy, sweet and aromatic, their appearance on the market stalls signals summer's arrival. I was lucky to grow up close to the biggest peach, apricot and nectarine producing region of Greece and every June on our way to our beach house in Fourka Beach we passed tens of small roadside stalls set up by local farmers selling their produce. On our way back, in early September, the same producers were there and this time they were also selling jars of jams and marmalades. 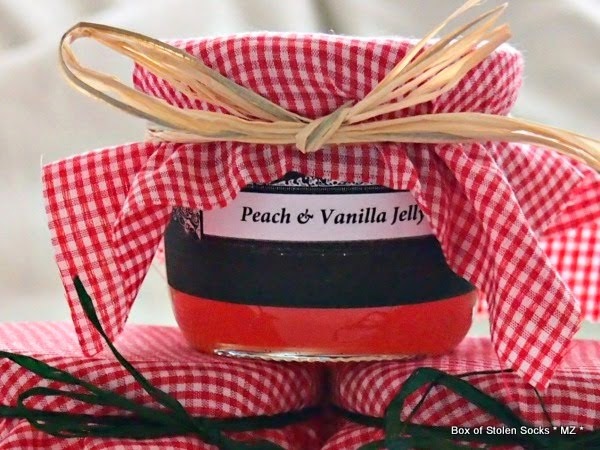 My mother always made her own peach and apricot jam so we never really bought any from the roadside merchants, but I can still remember the lovely colours of the jars and the sticky sweetness of the air surrounding the orchards. About a week after we came back from our vacation, I saw a box of beautiful, ripe peaches imported from Greece and I thought that I have to buy them and preserve them. I have never made jam before, actually let me rephrase that, I have never made a serious effort to make any kind of a preserve before. I planned and planned and even bought the jars but when the time came to pull up my sleeves and start chopping and boiling and canning I gave up and chose the easy option: buy them ready made from the supermarket or some local producer. Then I started blogging and I somehow became a bit more energetic and slightly more daring. Some of you might laugh, making jelly is not such a difficult thing. Well it proved it was not but it is somewhat more tiresome than simple baking and requires good planning. 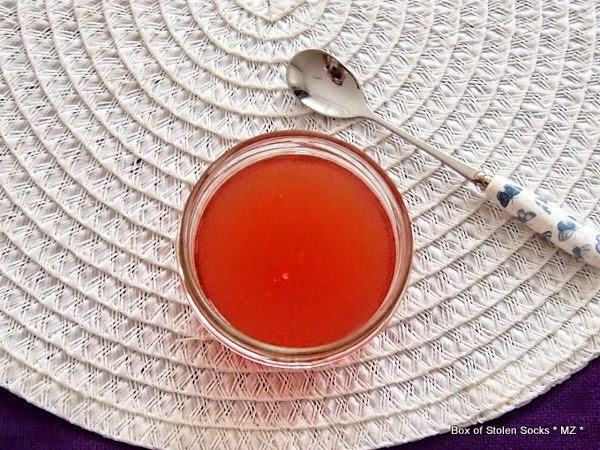 I found the recipe for Peach Jelly on a site called Add a Pinch in July and I pinned it on my Pinterest board for Jams and Preserves with the hope that some day I will make it, a hope that is born every time I pin something on any of my boards. Fortunately for this recipe, and for a few more to come, I found a blogging challenge called Bookmarked Recipes. It was founded by Ruth from Ruth's Kitchen Experiments and it is now hosted by Jacqueline from Tinned Tomatoes. This challenge "was set up to encourage food bloggers to revisit the recipes they have bookmarked from magazines, newspapers, cookbooks. websites, blogs, to try them out and post about them.". Now lets get on with the recipe!!!! I added a vanilla pod and halved the original recipe because it was my first time and I felt scared of failing and wasting 3kg of peaches. I was so wrong! It turned out wonderful, light and aromatic with a hint of vanilla. I gave a couple of small jars to some of Georgie's colleagues and they are asking for more and if possible bigger jars!!!! Put the peaches and water in a large pot and bring to a boil. Reduce to medium-low heat and simmer for 5 minutes. Remove from heat and skim off any foam with a stainless-steel spoon. Cover and allow to stand for 20 - 30 minutes. Strain the juice through a very fine mesh sieve over a large bowl. Use a fork to mush up the peaches and get more juice our of them. Line the sieve with two layers of cheesecloth and strain the juice two times. 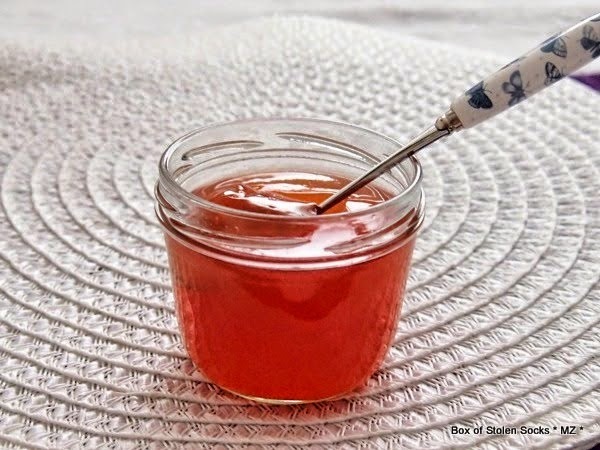 Combine the peach juice, pectin, lemon juice in a large pot and throw in the vanilla pod. Bring to a boil, stirring gently. Add the sugar and stir until it gets completely dissolved. Remove from heat and skim any foam that forms with a stainless-steel spoon. Ladle the hot liquid into hot jars leaving about 1cm of space between the juice and the jar cap. PS: Don't throw away the vanilla pod. You can leave it to dry and then put it in you sugar jar and you will have vanilla sugar!!!! Ooh, what a great gift! Gorgeous jelly. Must taste fab!